Some drivers think cyclists should not be allowed on roads, roads which they mistakenly believe were designed and built for cars. Some drivers have a ‘Get orff moy laaaaand’ mentality because they feel they’ve paid for use of the roads through ‘road tax’ (they should apply for a rebate, backdated to 1937). This feeling of ‘ownership’ is a global phenomenon. Many motorists believe only motorised vehicles should be on roads. In the US recently, this woman driving her kids to school ran over four school-children because they were walking on the street (a street with no sidewalks) and wouldn’t get out of her way. Infamously, Ricardo Neis, the 47 year-old driver of VW Golf that drove through a group of cyclists on a Critical Mass ride in the Brazilian city of Porto Alegre last week, clearly felt his rights as a motorist trumped the rights of cyclists when on public roads. This is a multi-lane highway. 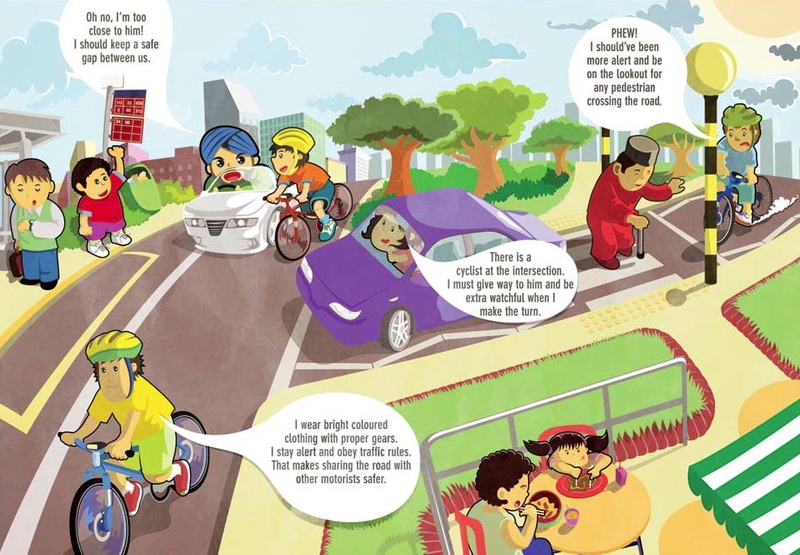 According to Singapore highway law (the pic above was taken from a Singapore Land Authority poster), cyclists shouldn’t ride more than two abreast, but they clearly do so when riding in the road gangs, partly as a safety measure. For other users read cars. In a follow up article, the Straits Times had a poll based on suggestions left by readers. Cyclists banded together to vote for the most cycle-friendly suggestion but the other ideas are chilling and also received lots of votes. This is true for Singapore, and true for the UK, too. Motorists – the Johnny-come-latelies of public highway users – do not have more rights than other road users, except on motorways. Nor are motorists traffic. According to the Highways Act 1980, traffic also includes pedestrians and animals…and cyclists. iPayRoadTax.com is an ironically-named campaign supporting the road rights of cyclists. The message that cyclists have equal rights on the roads is carried on iPayRoadTax t-shirts and jerseys. This entry was posted on Thursday, March 3rd, 2011 at 3:05 am	and is filed under Bloody Tax Dodgers!, No such thing as road tax!. You can follow any responses to this entry through the RSS 2.0 feed.